"Logan is doing WONDERFUL with his Proloquo2Go app! His demeanor and attitude has improved greatly since starting with the app. It brings tears to my eyes to see/hear him say "I want chips!" or "I want (insert specific song or Sesame Street episode)". One HUGE thing Stan and I are realizing is what we thought were his favorite Sesame Street episodes turned out to be so wrong! It broke my heart that I thought we knew what he wanted, but really didn't. Sometimes it is best to have our grant recipients share their experiences and their thoughts about grants they received. Please take a moment to read a thank you from a parent of a recent recipient. "I wanted to share our 3yr old daughter Samia’s experience with her IPad she was given last year thru Andrew's Gift.. she has came so far with her speech development and other skills thru applications on her IPad .. before she had her IPad she said several words and now she sings songs and counts numbers and says the the alphabet and her speech has come so far and it also helps her keep focused on learning skills... we want thank you very much for your generosity with the gift of the Ipad for our daughter and the training I was provided as well thru Andrew's Gift which was very beneficial as well .. Again thank you for your generosity it means a lot to us." Ryan and his new adaptive bike, thanks to Andrew's Gift! This is a picture of Ryan, who received his new tricycle-rad bike, as a recent Andrew's Gift grant. Thanks Andrew's Gift for making this possible! Yurielis enjoying her new bike from Andrew's Gift. Take time to read a recent letter from a parent of one of our grant recipients. The camp that he was able to attend through Andrew's Gift had a lasting impact on Daniel. A big thank you to Andrew's Gift from Tony! Sadie's Story - Learn how Andrew's Gift helped Sadie with assistive technology. Andrew's Gift is committed to empowering the autism community through technology. Learn more about Aidan and his new device provided by Andrew's Gift. 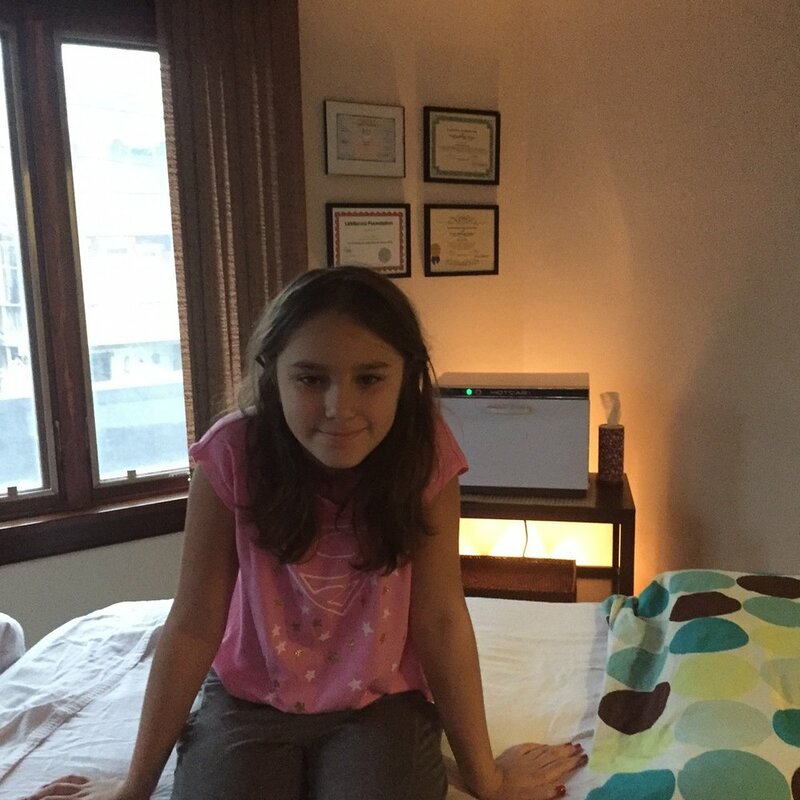 I just want to thank you for the gift of $160.00 for Laila to receive massage therapy from Doria at Spectrum Massage. She loves the sessions she is having. The day after a session she seems so more at ease and has less meltdowns. She is bending her knees a little better and I am so excited for her. I can't thank Andrew's Gift enough! You all have such wonderful hearts and your generosity is just inspiring. Thank you for this amazing gift! "We have received Nikolai's blanket and I've tried to get some pictures for y'all but he really wasn't a fan of the camera I hope these are well :) he really likes his blanket and his iPad." They even promote social interactions by getting the kids to work together in the gym. Then last week they invited us to sit in front of their Hershey location to watch the Halloween parade while they were walking in it, and when they came past us, they scooped Owen up and took him with them. He was all smiles and laughed the entire time we walked the parade route. These guys are not only amazing at what they do with the kids while they're in the gym, they make their clients feel like a part of a big family. Having local organizations like Andrew's Gift and Fitness 4 Focus who genuinely care about the special needs kids in the area means the world to us parents. Thanks again!! Andrew's Gift is proud to have been able to help Katelyn with her new treadmill. Keep up the good work, Katelyn!! Andrew's Gift is happy to have provided three sisters with a new gift for the holiday season. This is a thank you note from Grace and her family for the iPad they received at the October iPad training. We are so happy that Grace is using it and having fun with it. Andrew's Gift is so proud to share this amazing picture with everyone...one of our grant recipients with her service dog...during training with her new friend!!! Best of luck to you and your new friend!! Check out the website to see all the wonderful work going on with SSD. Susquehanna Service Dogs raises and trains services dogs to assist children and adults with disabilities to become more independent.